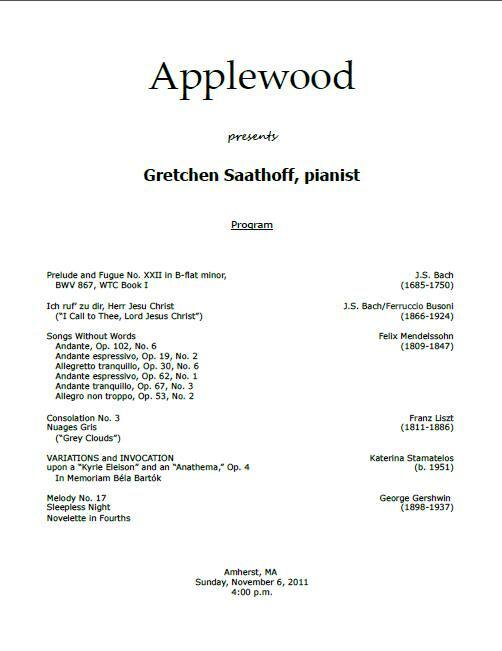 On Sunday I played the 3rd of 3 concerts based on the same program. 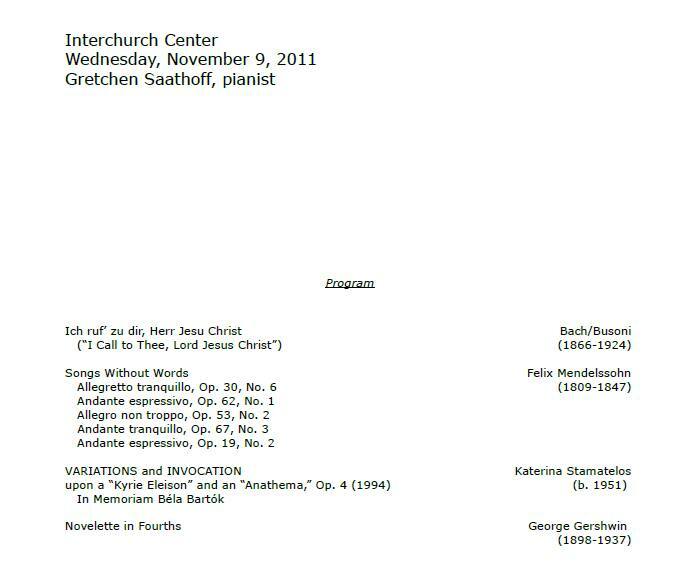 This was the Williamsburg, MA concert rescheduled from October. The drive to Williamsburg was much easier today. No storm! We had lunch at the Brewmaster’s Tavern (pictured above), which was excellent. During the time between lunch and the concert (about an hour), there were any number of distractions. I was focused, and found myself able to ignore them. A father walked in with his 2 young daughters. They sat in the front row, right by the piano. I was thrilled! Just before concert time, a friend arrived. It was very nice to see him. He had come to the dinner during the power outage, and I had not expected him to make the trip a 2nd time. Playing 3 concerts together worked! My playing in this concert was the best of the 3, as it should be. I wish the piano had been better, but I’m happy to have gotten something out of it. As is my habit, I spoke to the audience rather than providing printed program notes. 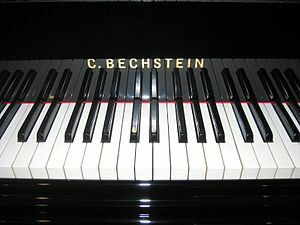 The Bach and Bach/Busoni shared the 1st verbal note. I explained a few ways in which a fugue is different from a round. And I shared a few details about Bach chorales. (This was a Congregational church. “Ich ruf’ zu dir” was not in either hymnal I consulted.) Then I suggested that Busoni, a Romantic composer, would sound completely different from the prelude and fugue. Everyone laughed when they heard that Mendelssohn‘s “Songs Without Words” have no words and never did. Then I indicated that the 3rd and 6th pieces I would play had titles, inviting them to make up their own titles for the others. Before playing the Gershwin, I played a 4th on the piano, explaining that we aren’t accustomed to hearing that interval as a pleasant sound. Then I added the 3rd below (to form an inverted triad), then 3rd below that. Now that everything sounded normal again, everyone enjoyed the piece! Looking for practice inspiration? “Goal-oriented Practice: How to Avoid Traps and Become a Confident Performer” will give you a fresh perspective! Yours truly played a concert in New York on Wednesday. Actual program will be posted here as soon as it is received. Everything about daily life that could go wrong the week before, did. I felt like I couldn’t handle it all, nearly canceling the concert. And then, things kept getting worse! The day before my trip, not only did some dental work fall apart, but my plans to stay with a friend fell through. A Skype video call enabled me to put all the negatives in a box and forget about them. They would still be there when I got back, if I wanted them. Fortunately, I have more than one friend in New York! An email resulted in a quick reply with a gracious invitation to stay with a lovely person in a beautiful apartment in Midtown. The trip into the City was easy and uneventful. I found a cab in 2 seconds, and even scored a friendly driver. The street noise kept me awake ½ the night. It wasn’t particularly loud, but I’m not used to it anymore. We were on the 4th floor with a window open. When I arrived at the concert venue, the music director was out of the building, the piano was in the corner, someone was praying aloud, and no lights were on. So I asked a desk clerk to have the lights turned on (which they were in 2 minutes) and moved the piano myself (but I’ve done that before). The desk clerk assured me that warming up would be fine while the prayer was in progress. My practice time, about ½ hour, didn’t go well at all. Possible reasons are too little sleep, nerves, the extreme acoustics (reverb), and the climate (hot and humid). I felt like I had a fever! Even just before the house was opened to the public, I wasn’t feeling good about the way I was going to play the concert. And that, for me, is very unusual. I decided the way to go was not to rely on what I expected to come out of the instrument, but to listen to the actual sound and deal with that. Things proceeded normally. The 1st half was Bach/Busoni and Mendelssohn. I felt completely settled in the 2nd half with Katerina Stamatelos’ piece and Gershwin. I wanted to talk to the audience because it has always worked. Nothing profound ~ it wasn’t a lecture recital. I told them that the “Songs Without Words” don’t have any words and never did! Scholars have been searching, believe it or not. And I told them that Mendelssohn named only a few of his songs, publishers named the others. I encouraged people to make up their own titles. When I said that I’d “met” Katerina Stametelos on Twitter, some people said, “Oh!” Others smiled ~ all looked intrigued. I told them that Katerina lives in Greece and earned 2 degrees at the University of Iowa, and why I felt a connection with her. The music director had asked me to assure him that my program was 30 minutes, not longer. Apparently recent concerts have been longer, making people rush for lunch. He has received complaints. So I was conscious of the time frame during my concert. I omitted 2 repeats in order to allow talking time. After my program, as the audience was applauding, I found myself taking a bow and then speaking again, saying something like, “That’s it ~ everybody go to lunch!” And I didn’t make a grand exit. That was a chance happening. And it worked! More than twice the usual number of people approached me after the concert! “You made my day!” I recognized the man from 2 years ago, when I had performed Messiaen. We had discussed Messiaen then. One woman said she is the organist at a small church “down the street.” She had played “Ich ruf’ zu dir” on the organ, but this is the first time she had heard the piano version. Since the organ she plays had stopped working, she would look at the Bach/Busoni. Another woman asked about Katerina’s “In Memoriam Béla Bartók,” wondering whether they knew each other, or what that was about. I got together with 4 friends on this trip and had a great phone conversation with a 5th. Four of us (3 friends plus myself) enjoyed lunch on Amsterdam Ave. just South of 120th St. My friends had never met each other, but have common interests, so we all had a good time. Later that evening, I had a sandwich and a wonderful time seeing someone who couldn’t make the concert. He has so many interests and so much curiosity, he is always fun to talk to. After dinner, I had an ice cream attack. So I walked around the neighborhood in search of a deli. What I found was a Johnny Rockets restaurant (50’s or 60’s American diner) at 56th and 3rd. At the takeout counter, I ordered 2 dark chocolate shakes to go. The cashier took my payment and made change for a nickel. Her arm extended back, and she slapped the nickel on the counter! Welcome to New Yawk. If my change had been a $5 bill, would she have turned around? What would it take to score eye contact? The bus driver had no clue. At Port Authority, he announced that we were boarding a Hartford bus. The destination, Springfield, is clearly posted. In New Britain, he asked the passengers if anyone knew how to get to Route whatever. Soon after that, he became lost for 10 mi. Then we encountered traffic backed up from an accident. After that, a passenger had to direct him to the gate in Springfield as soon as he left I-91. Then we changed buses. The next driver was very unpleasant. But it turned out there was also an express bus to Amherst. So the last 45 minutes of the trip were normal. We arrived in Amherst 2 hours and 20 minutes late! I called the complaint number the next morning and demanded a refund. I’m glad the mega-glitch in the trip happened after my concert! Continue to facilitate audience engagement. Look to NY as a reality check rather than feeling discouraged by recent changes in the focus of various concert series and the local situation. Practice, plan future programs, incorporate more contemporary music, organize house concerts. Twitterhouse concerts? I decided to take the bus rather than a cab. 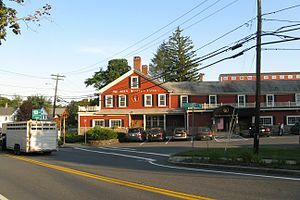 Applewood is just is a short walk from the Hampshire College bus stop. However, this was homecoming weekend at UMass, plus Trick-or-Treating postponed due last weekend’s storm. The bus was 50 minutes late! Fortunately, there was extra time built in, so all I missed was extra practice time and a some pre-concert relaxation. Several friends came, including a former housemate from college! Whoa. I was not paid. I have the name and phone number of the person to call. He will no doubt send in a requisition, and I will receive a check in the mail in a month or so. 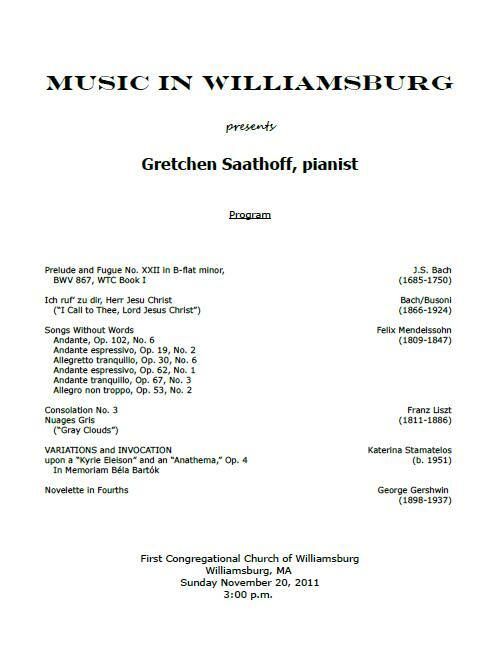 On Wednesday, I will be playing the program below in New York. I will write another post upon my return. A friend took me out to dinner! We had fun, and I enjoyed the break a great deal. I think I’ll sleep well tonight! I’m exhausted!!! I’ll do the Sunday puzzle tomorrow night. 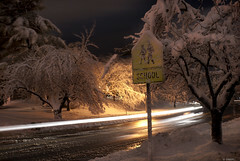 We had almost 12″ of SNOW on Saturday afternoon and evening! In October! The record for this time of year in Western Massachusetts is 7.5″. The church dinner went on using candlelight, but my concert was postponed. So now I have an additional week to practice before my next scheduled performance! My blog series about this program could now be called, “The Ever-changing Story!” Keep reading. You’ll see why. Saturday was an exercise in patience. I called around 11:30 a.m. to see if the concert was on. A major snowstorm had been predicted for mid-afternoon and evening, and the sky was becoming darker and darker. My body told me it was definitely going to snow. There was no answer, so I left a message. Then I practiced for an hour and called back. I asked if there was a backup plan, considering the weather report. The answer was no… the church deacon said it wouldn’t snow ’til midnight. I finished practicing, took a shower, and looked out the window about 2:15 p.m. It was snowing hard. I called again. The person in charge of the kitchen said they had to do dinner because all the food was already cooked. The plan was to have dinner, then look outside around 6:30 to check on the weather. If people felt they needed to get home, we would postpone the concert. By that time I felt that the concert definitely would be postponed, so getting ready to leave was hard. Getting ready normally puts me “in the groove” to perform. This time, though, it was “maybe I will, maybe I won’t.” The lack of decision by the presenters caused uncertainty on my part, affecting my mood and level of excitement. 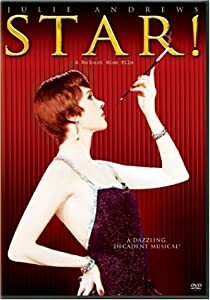 Most times, cancellations are made well in advance: for example, Smith College announced the cancellation of its Saturday concert the evening before. Concert makeup, concert hair, and concert dress happened anyway, and I packed up my music and heels. We arrived after 5:00, driving bumper-to-bumper the entire time. I began practicing at 5:10, with dinner scheduled for 5:30. At 5:15 the power went out! After some discussion about my playing by candlelight (which might have worked with 2 candelabra and large flashlights), the deacon decided that elderly people shouldn’t be going up the stairs by flashlight. (The church sanctuary is located on the 2nd floor.) So the the concert was postponed, date to be confirmed. Dinner was excellent, served and consumed by candlelight. Not many people showed up. A former co-worker came, driving some distance. We were surprised to see him, and had a good time talking. We had an extended discussion about a new concert date. It will tentatively be Sun., Nov. 20th (1st choice) or Sat., Nov. 19th, at 3:00. A busy time in the church year is coming soon: Thanksgiving, Advent, a church fair, and Christmas. Any proposed date for the church calendar has to be approved by the deacons. Not all of them were present, so we are awaiting the next church service or deacons’ meeting. With the major snowstorm and loss of power at the church, I wonder whether the service was held this morning. If one chooses to be positive, as I was after a short time, this can be turned into an advantage! I have an unexpected additional week to practice before the next scheduled concert, same program. This afternoon, it felt great to practice with the sun streaming through the window, reflecting intensely off the snow. The Town of Amherst has canceled just about everything for Monday, as there is a wide-spread power outage and most businesses are closed. There will be no school, including the closing of all 5 colleges. So I get to stay home and practice tomorrow! There’s tennis to watch, too (Basel, Switzerland)!!! Free snow day! Have you experienced a rescheduling with a long decision time? This is probably the most difficult cancellation I have encountered. Warming up for afternoon concert!